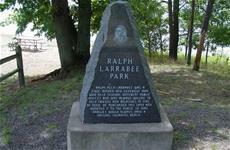 Ralph Larrabee Park is located at 7531 Round Lake Drive approximately 1 1/2 miles south of Danbury on the northeast shore of Round Lake in Swiss Township. This land was donated so that families would have a recreational area with a natural swimming beach. Facilities include picnic tables, grills, beach and parking area. Burnett County Parks are DAY USE only and cannot be reserved. They are on a first come/first served basis with no user fees.